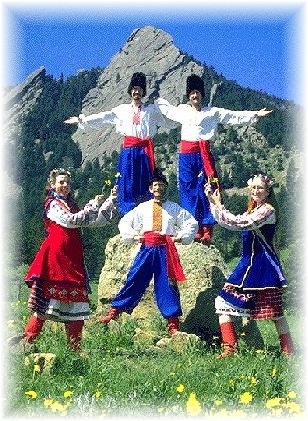 Postoley Dance Ensemble is a performing ethnic dance company specializing in the culture, music and dance of Ukraine and Poland. We offer spectacular and informative performances for schools, universities, the community, festivals, parties and special programs. Performances are done in beautiful original costumes with authentic live music. Postoley Dance Ensemble is a non-profit (501-C-3) dance company devoted to promoting multi-cultural understanding. Rehearsals take place each Thursday evening at 7:15 pm at the Danceophile Studio, 250 31st Street in Boulder (between Moorhead & Ash Streets in South Boulder). New members are welcome at any rehearsal. Prerequisites: Some dance experience of any sort + willingness to learn + enthusiasm. We also have openings for musicians and singers! Rehearsals are open - feel free to come and watch as well.